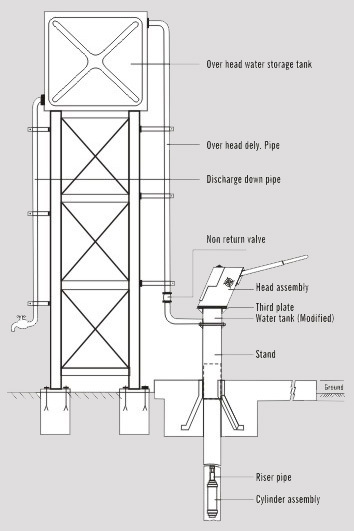 India Mark II deep well hand pump with modified water tank assembly is capable of delivering water to a over head water storage tank mounted 25 feet above the ground level. A discharge pipe line can be connected to various locations for domestic use. The schematic shown is very much suitable for school toilets, for sanitation purpose as well as gardening, small communities piped water distribution system.